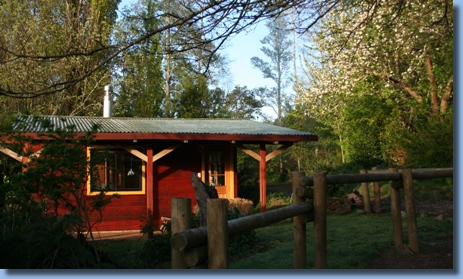 On the farm we offer two options for your stay : In a cozy cabin and single or double rooms in a wooden guest-house. Situated between the Liucura River and the forest reserve of ”Cerros de Quelhue” mountain range, you get great views from nearly everywhere of the snow-covered Volcanoes Villarrica, Quetrupillan and Lanin. 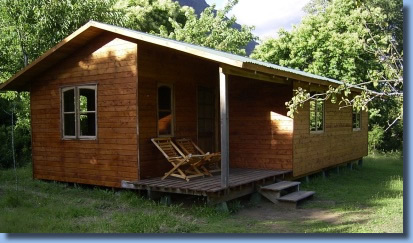 We love to give you a hand organizing activities in the surroundings by giving you hints and tips or organizing a all inclusive package for several days on the farm including options to conquer the Villarrica Volcano, go trekking, go horseback riding and many more. In order to make your stay more comfortable we offer laundry service . overlooking the horses' hitching and saddling area to one side, and the old orchard with the crystal clear river behind it on the other . Because the little demand, from 2017 on we will not longer keep the campsite open. You could still camp fire-pit and toilet are working but there will be no showers. Our campsites are the perfect choice for those who seek a quiet stay surrounded by nature. A convenient starting point for trekking, fly-fishing excursions, trips to the nearby National Parks or just for relaxing. Kayakers will find an ideal play spot right here in the river. 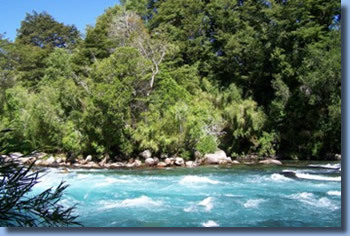 Our campsites on the riverbank are surrounded by shady trees and offer a great view of Volcano Villarrica. They offer a covered space for BBQ and open fire pits, as well as a hot shower and country bathroom.